There was a redoubt standing apparently as early as the period of the Great Moravian Empirical at the place of the present manor. Its fate was determined by the fact that in about 1110 the market town of Kroměříž became the property of the Olomouc bishops, the richest feudal lords in Moravia. In the second half of the 13th century bishop Bruno of Schaumburk elevated the status of the town to that of a city and built a Gothic castle here. 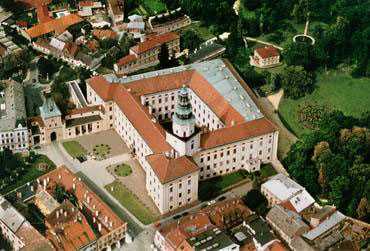 At the start of the 16th century it was refashioned in the Renaissance style and became the residential seat of the Olomouc bishops. In 1643 the city and castle were damaged by the Swedes and not until the time of bishop Karel Liechtenstein-Kastelkorn (1664 - 1695) was the manor rebuilt. 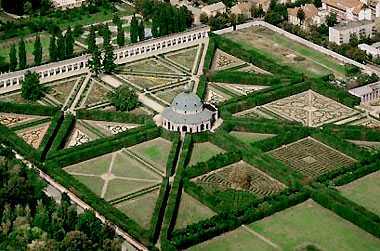 Its construction had lasted for 12 years and was executed according to projects of the significant architects Filibert Luches and Giovanni P. Tencally. The manor is dominated by an 84 meter tower. Behind the structure is a magnificent Under palace Garden, which is still topped by a slightly more distant Flowery Garden with extraordinarily valuable garden architecture. 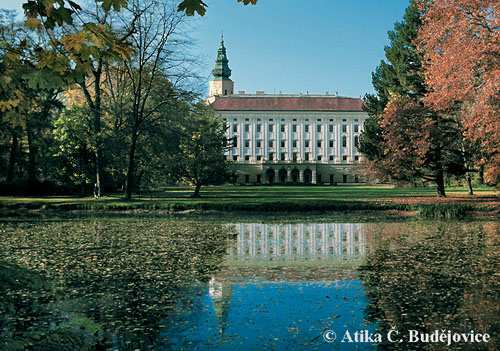 The representation and residential premises of the Kroměříž manor belong among the most valuable manor interiors of Central Europe. The Hunting, Advisory, and Throne Halls, the Rose and Czar's Rooms are areas, that might adorn any historical monument. The Vassal Hall with its ceiling fresco by F. A. Maulbertsch, the manor library with its ceiling painting by the Brno painter Josef Stern, who is also designer of the fresco in the manor chapel, and the Parliamentary Hall with three ceiling oil paintings by F. Adolf of Freenthal are all outstanding for their decoration and furnishings of extraordinary artistic value. All the aforementioned paintings date back to between 1759 - 1772. 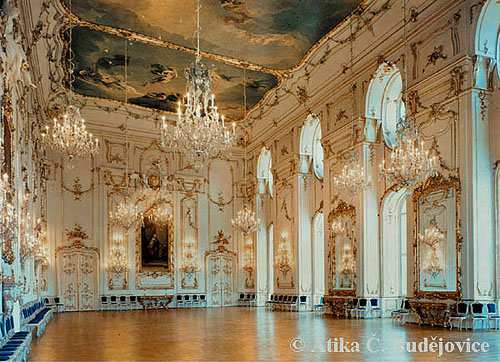 The area of the Parliamentary Hall alone (with 22 crystal chandeliers) covers 400 square meters. On the second floor of the manor is located the palace picture gallery, being the second most significant in the Czech Republic after the Prague gallery. Within its ten halls visitors can behold paintings of which several are world renowned. Various artists are represented in the gallery, for instance, Lucas Granach Sr., Hans von Aachen, Jacob Basano, Paol Veronese, Tizian (the work entitled "Apollon and Marsyas"), Jan Brueghel senior, Ant. van Dyck, and Johann H. Schönfeld.